We’ve kept you waiting for some time, but thankfully finally can show the progress in Guadalupe. Despite being designed back in 2008 by Mexican-American HOK Sport team (later divided into Populous and VFO Arquitectos), the project only received its green light in August 2011, which allowed for preparatory works to be done in October of that year. With Monterrey in its name one should assume it’s located in Monterrey, but in fact it’s based in Guadalupe, not far behind Monterrey’s boundaries. Estimated to last 30 months, the $200 million construction is now reaching the most interesting level – slanted supports of upper tier sections are almost done, so installation of the stands themselves should start relatively soon. Then there’s all the steel structure with roof and cladding, that will show just how interesting the new bowl is. The stadium will have a dynamic shape, sloping lower towards the south. Architects said it would make a batter relation to the nearby mountains, which – by the way – fans will be able to view thanks to the declinatory shape. 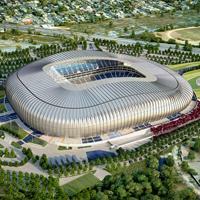 Not only that, the pitch will also receive more sunlight with that move, which makes the new 50,000-seater resemble another Populous work – the Aviva Stadium in Dublin. Despite being surrounded by parking spaces, the stadium should give an impression of green space with plants supposed to cover a third of the entire plot. Trees between parking sections, grass in the bays, water collecting system and efficient energy use should make this venue exemplary not only for many other Mexican stadia, but also those in other countries. If Constructora Maiz Mier make it in time, we should see the stadium ready for opening within a year. But looking at it realistically one may suspect a delay is possible. Most of the 30-month contract has already passed, while construction still has a long way to go.